Magnum continues to build momentum as one of the hippest vehicles on the road offering a bold, unique profile, exceptional versatility, optional HEMI power and both rear-wheeldrive and all-wheel-drive performance. 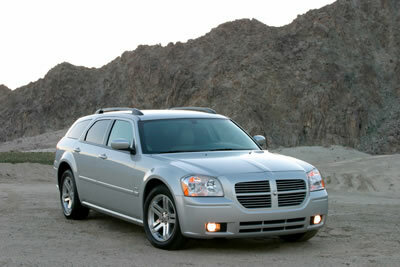 The Magnum lineup includes the rear-wheel drive Magnum SE, Magnum with the SXT package and the HEMI powered Magnum R/T. The Magnum SXT and the Magnum R/T also are available as all-wheel-drive models, which provide traction control in all-weather and all-surface conditions. Magnum SE features a 2.7-liter V6 engine mated to a four-speed automatic transmission. Chrysler Group’s five-speed fully automatic transmission is matched to a 3.5-liter High Output V6 engine on the Magnum with the SXT package. The five-speed automatic transmission equipped with AutoStick®, a driver-selectable range control, offers fully-automatic or manual shifting selection.